Design trends for siding seem to be steering away from muted, neutral colors into either pure white or rich, saturated and dark tones—including pure black. Bold cladding choices can make the architecture appear more dramatic, but there are some things to be aware of if you’re considering dark (or black) siding. Dark colors gather more solar energy than lighter colors. So on products that are prone to dimensional changes due to temperature—described as the coefficient of thermal expansion (COTE)— or that have low melting points, color options may be limited. Because darker colors heat up the substrate more, they will be more likely to increase movement. Another issue is fading. Most exterior finishes “chalk” to some degree, which protects the underlying product, but excessive chalking is not attractive. In other words, when it comes to dark colors, your choice of cladding matters. Let’s take this material by material. If you want a true black look, vinyl is not the siding option for you. There are some shades of vinyl that are fairly dark, but you won’t find a true black. I asked one manufacturer why that is, and was told it’s due to lack of market demand. 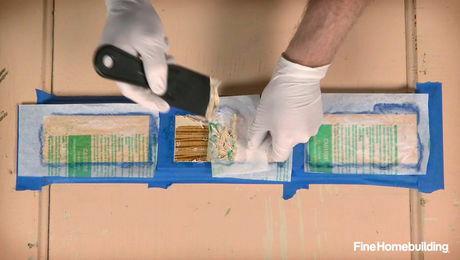 Several manufacturers warranty their vinyl siding offerings against “excessive color fade,” but don’t always quantify what constitutes “excessive.” Painting existing vinyl siding (or painting over cellular PVC boards such as Azek or Kleer) is another matter—it’s possible, but in those cases, paints usually have to be kept to a light-reflecting value (LRV) of 55 or greater (see drawing below). Generally, it’s important to use a paint color no darker than the original color of the vinyl itself in order to avoid problems with expansion due to heat absorption, but Sherwin Williams has a line of colors made for vinyl siding, which can be mixed from several of their paint lines. 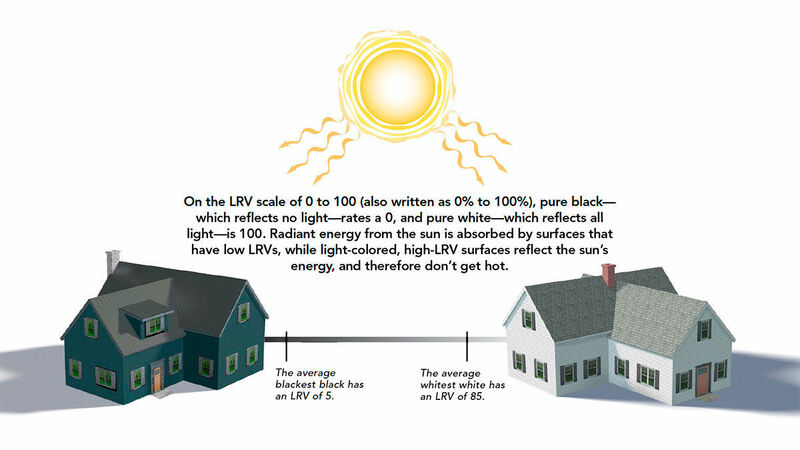 The Solar Reflective Index (SRI) is more accurate than the LRV at measuring a surface’s resistance to absorbing solar energy, though it’s used mainly for roofs at this point. A couple of composite products you might consider are LP SmartSide, an engineered wood siding, and Boral TruExterior, a blend of resins and fly ash. The COTE for the LP SmartSide is 0.0000017 in./in.°F, which means a 10-ft. length will expand less than 1⁄32 in. when the material temperature increases by 100°F. LP doesn’t limit choice of topcoat color—it’s available as preprimed only. According to Boral, their TruExterior siding may be painted with “any high-grade exterior paint” and “may be painted any color without special precaution as the product is not prone to excessive movement due to heat buildup.” They don’t warranty paint performance, and I’ve heard some issues from painters about sprayed paint bubbling a bit, but there is no reason to shy away from dark colors. The COTE for TruExterior is less than 0.000014 in./in.°F , which means a 10-ft. board experiencing a 100° change in temperature would only move 0.17 in., which is less than 3⁄16 in. Fiber-cement siding comes factory-painted or primed and ready for painting on site. You can paint it with 100% acrylic latex paint. Looking at the offerings from James Hardie, you’ll find that standard factory colors are not particularly dark, but they do not place a limit on what colors you can apply, nor warranty their product for third-party paints. I’ve designed projects with James Hardie panels that were painted black with no problems. A 10-ft. plank of James Hardie fiber-cement siding that experiences a 100°F change in temperature could see up to 0.54 in. in dimensional change. This can be accommodated during installation, and paint should be able to flex that much with no trouble, but it’s a large enough change that you should plan for it. Wood siding installed over a ventilated rainscreen can last a very long time, and with occasional recoating, a stained or painted surface applied to a durable species of wood can last at least 100 years. Of course, rot-prone wood or siding without a rainscreen will not fare nearly as well. Wood moves with changes in moisture, which is why a rainscreen gap is so important, but despite popular belief, it hardly moves with temperature changes. Our theoretical 10-ft. board would move about 1⁄32 in. over a 100°F change in temperature. 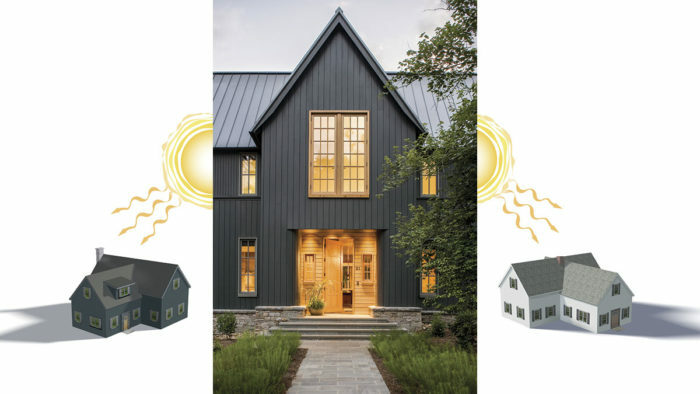 Keep in mind that wood siding installed tight to a WRB may be more prone to cupping when it has a dark finish, due to solar vapor drive pushing more moisture through the wood and allowing it to saturate the back of the siding. That’s one reason why coating all surfaces before installation is important, and why a well-detailed rainscreen is usually a good idea— it allows the back of the siding to dry before becoming saturated. Charring (known as shou sugi ban) is another option that has been practiced for centuries in Japan—just burn the wood surface until it’s deeply charred and install for a low-maintenance, dark to very dark siding. Or consider a treated wood product, such as Perennial Wood or Accoya, which are acetylated for rot resistance. Although it’s far less popular than the other materials listed, I’ve used metal cladding on buildings. As with other materials, in general, darker surfaces get hotter; if your metal siding is installed without a ventilation gap, you might need to consider a high-temperature underlayment, or risk possible (though unlikely) melting of the WRB. One more thing to keep in mind—if you’re in an area where it snows a lot, and you have roof overhangs, according to Dr. Joe Lstiburek of the Building Science Corp., you are at high risk of ice damming due to the overhangs capturing heat rising off the siding and getting trapped under the roof overhang. Adding soffit vents below the overhang just directs more warm air under the sheathing, making the ice dams worse. Dark siding also makes the problem worse, according to Lstiburek. His “BSI- 046: Dam Ice Dam” bulletin discusses how to solve this issue while keeping dark siding— primarily, insulating the overhang and putting ventilation intakes at the fascia. So, which siding should you choose if you want dark-colored cladding? Wood is always my first choice of siding, regardless of color, because it holds crisp edges and smooth surfaces, is, subjectively, by far the nicest of the solid (non-vinyl) cladding materials to work with, and has the lowest embodied carbon. In fact, wood can be net carbon negative (a good thing) as opposed to the manufacturing-heavy products that are net carbon polluters. But there are situations where wood is not the best choice, such as in humid or fire-prone locations, or on an existing wall where a rainscreen is not possible. In those cases, I would lean toward LP SmartSide, particularly because of its balance of cost and performance. Poly ash, currently a category represented by only one brand—Boral—would be my third choice. It’s extremely durable and is considered environmentally friendly due to its recycled slag content, but it’s on the expensive side and is fairly nasty to work with. Fiber cement would be acceptable, but my fourth choice—it’s the worst when it comes to worker health, cement is energy-intensive to produce, and the product expands and contracts more than I’d like. Still, it has a solid reputation as a durable cladding material. Given those four options, I generally don’t use vinyl. But it is probably more affordable than the other choices and may be acceptable if you aren’t looking for a truly dark color.